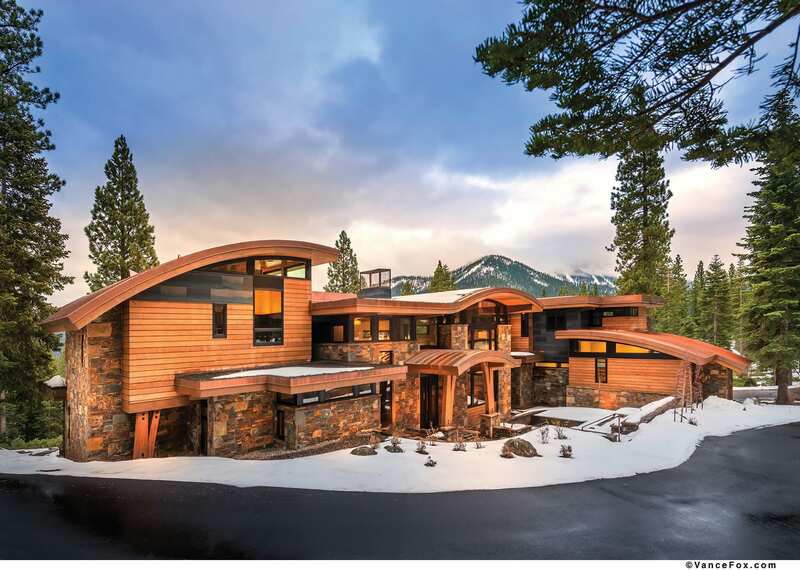 The MWA-designed and NSM-built home in Truckee’s Martis Camp is a compilation of dramatic arcs, rustic materials and modern elements. 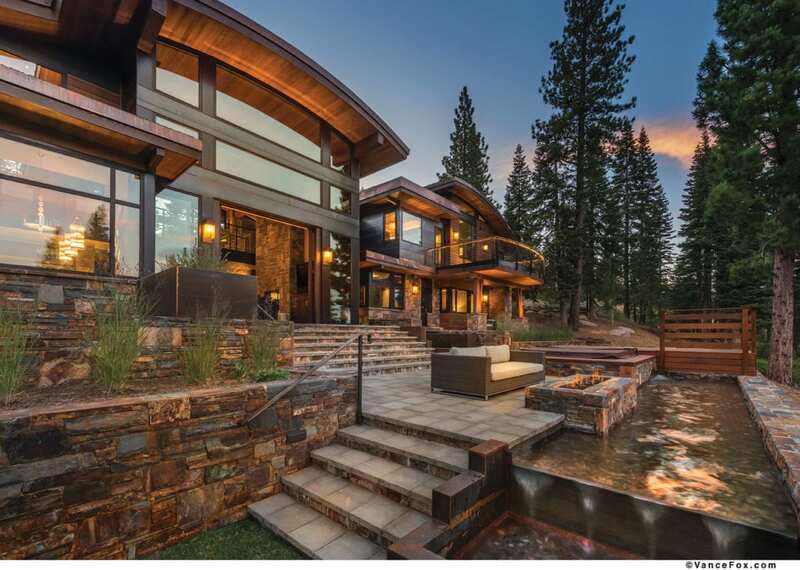 The clients first approached architect Kristi Thompson of Truckee’s MWA, Inc. in 2011. They liked the idea of a “mountain modern” home and had a basic design in mind, but the feature they were really set on was a barrel-vaulted living room. “My thought was to play on that barrel and extend it over the whole house with these swoops and half barrels and another barrel for the entry,” Thompson says. On the exterior, that translates to stacked ashlar-style stonework, clear cedar siding and hot-rolled steel. Timber radius columns mirror the surrounding trees. Large expanses of glass and exposed wood soffits that extend from the inside out give the striking curved roofs a sense of floating. The entrance is unencumbered by garages, both of which are tucked behind the home as to not affect the massing. 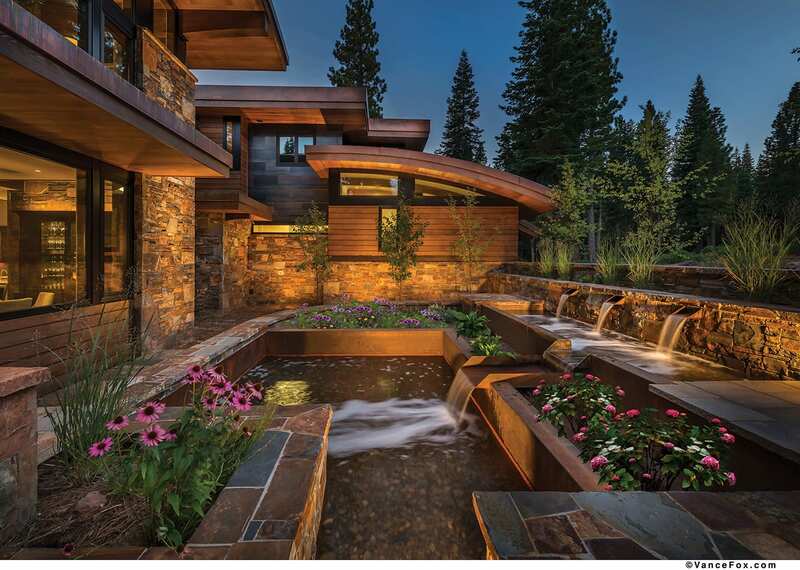 A linear waterfall streamscape—which flows under the entry bridge and continues to the back of the home—provides a sense of tranquility. The remarkable entry procession culminates as one passes through the hefty, hand-forged front door, which opens into a massive great room. 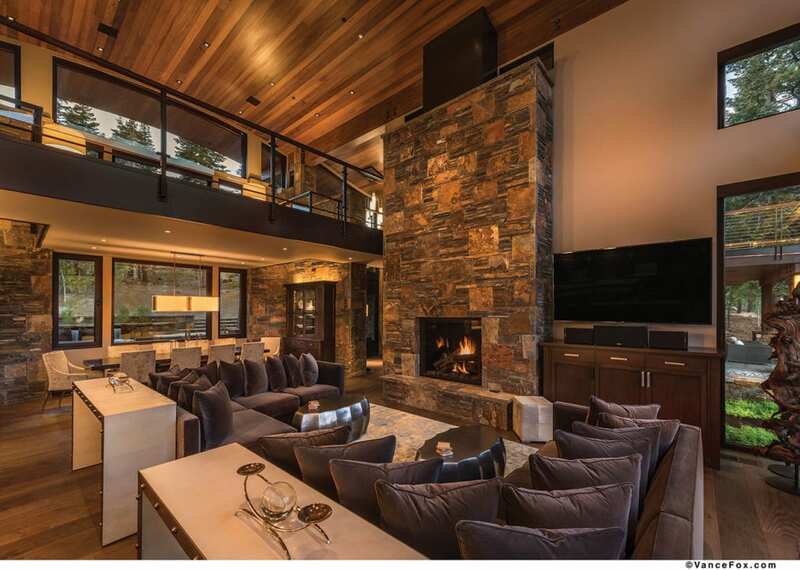 A window wall, the lift-and-slide doors of which open to an outside patio, looks east to the Carson Range, while the home’s exterior stonework repeats in the two-story-high stone fireplace. A neutral palette of wall colors, furnishings and materials keep the feel warm and rustic, while metal and glass detailing add a modern touch. 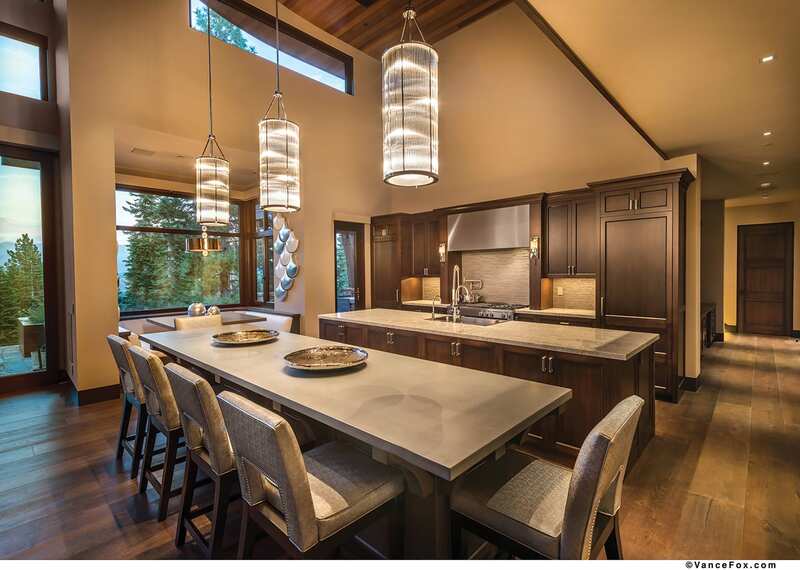 “[The clients] wanted a modern, elegant home,” says designer Julie Johnson-Holland, owner of Truckee’s JJH Interior Design. The great room is open to a breakfast nook and gourmet kitchen highlighted by dual granite-topped islands, which increase storage space and allow one to be used for prep work and the other, lit by oversize crystal pendants, for informal meals. Bavarian wide-plank oak flooring runs throughout, uniting the spaces. A dining room near the entry is set off by Montana stone walling; it is located under the open, upper-story bridge, creating a more intimate area for formal dining. 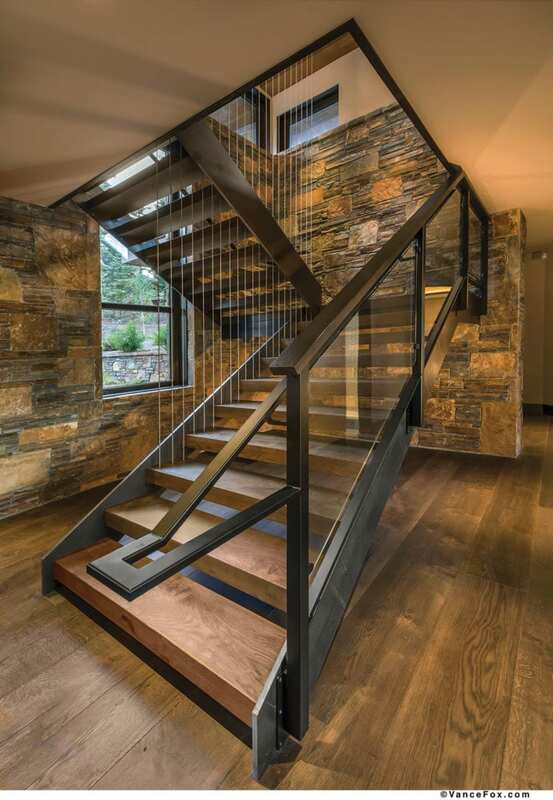 A dramatic open stairwell—the wood treads contrasting with steel, glass and cables that suspend the stairs from the ceiling—leads to the upstairs master suite. This space encompasses a spa-like bathroom with a curving glassed-in shower, marble countertops and contemporary vertical tile accents, while the tub shares a two-sided fireplace with the master sitting area beyond. The curving rooflines and clerestory windows allow even the bathroom and the two master closets to receive natural light. The bridge off the master suite utilizes unobtrusive glass and steel railings; dual chaise lounges create a seating area to stretch out and take in the fabulous views while still feeling connected with the great room below. Designed to accommodate a crowd, the house also boasts a first-floor guest master suite, complete with fireplace and private access to a covered patio, plus two guest suites and a bunk room. Other features include a game room with ping pong table, executive office, fitness room and a TV area, perfect for movie nights. Indoor-outdoor living was essential to the home’s design and executed flawlessly. The outdoor features, Thompson says, were a collaboration between herself and landscape architect John Pruyn of High West Landscape Architects. “I laid out the different levels of patio and John ran with that theme and really went all out with some cool additions, like the little bridge that connects the two patios and the waterfall features and the grassy plateaus,” she says. An outdoor kitchen just off the main indoor kitchen contains a wide grill and hood, refrigeration and plenty of counter space. The kitchen and dining areas total about 550 square feet; ceiling-mounted heaters allow for dining al fresco even in chillier weather. Covered patios add about another 1,200 square feet of outdoor living space, while a lower terrace includes a fire pit situated by one of the water feature’s pools. The home spent about a year and a half in construction, and the crew included many local subcontractors. The entire home is a testament to the care and dedication that went into its construction and design, from the dramatic rooflines to the outdoor water features to the premium indoor materials. This home has curves—and knows how to flaunt them. Alison Bender writes from her home at the foot of Mt. Rose, www.alisonobender.com.